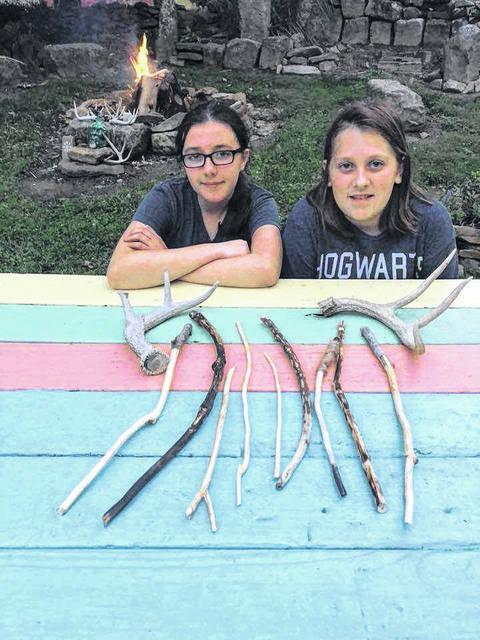 Lily Colley (left) and Silas Easter (right) kickstarted a new venture after trying their hand at whittling wands. RIO GRANDE — It was during the fall equinox that seventh grader Silas Easter decided to try his hand at whittling a wand. He asked his dad for help, invited his friend Lily Colley over to join him and “Silas and Lily’s Magic Emporium: Witchcraft and Wizardry for Everyday Use” was born. Since that evening, the duo has been hard at work making wands they plan to sell at the Raised Around Rio Farmer and Artisan Market in the Spring. In addition, they also plan to make items like potion bottles and dreamcatchers to sell and have a “decorate your own wand” table at their booth. As they make more wands, both said ensuring each one is unique has been the biggest challenge, so far. Not only do they draw inspiration from popular culture, they also add beads and other decorations to creatively set each wand apart from the other. While they are focusing right now on building up their inventory, they have made a few sales to friends and family. Follow the Raised Around Rio Farmer and Artisan Market on Facebook at https://www.facebook.com/Raised-Around-Rio-Farmers-Market-156300561441281/ for dates and information. Michelle Miller is an independent author and freelance writer living in Gallipolis, Ohio. You can follow her author journey at michelleleighmiller.com.